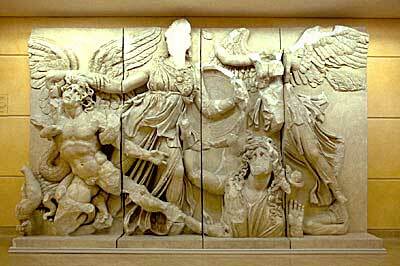 It is here that Gigantomachy, the battle between the giants and the olympian gods took place. Here in the west part of Halkidiki, the ancient site of Flegra (Pallini) Egelados is burried. It is also here that Athos created the mountain by throwing a huge rock against the Olypmian gods. Even Sithonia is named after Poseidon's sun Sithon. It all began at the beginning when there was nothing but a mass of everything mixed together: darkness and light, cold and heat, nothing was separated from anything else. This mass of everything was given the name 'Chaos'. Mother Earth was the first to appear out of Chaos and Father Sky followed her. As the first rains fell from Sky to Earth, flowers and trees began to appear; then rivers began to flow and lakes and seas were created. Next, Mother Earth produced the hundred-handed giants and the Cyclopes, giants with only one eye. Together, these giants rebelled against Father Sky so he shut them up in a gloomy underground prison named Tartarus. Earth and Sky then produced twelve more giants called Titans. The Titans released the Cyclopes from Tartarus and with their help, overthrew Father Sky. Cronus was the leader of the Titans and now became ruler of the universe. He first imprisoned the Cyclopes again and then married his sister Rhea. They had six children but Cronus swallowed each as they were born as Mother Earth had foretold to him that he would one day be overthrown by his own children, just like Father Sky. However, Cronus had been tricked when his sixth child had been born. Rhea had given him a stone wrapped in baby clothes and he swallowed this instead. Thus, the child named Zeus was saved. He was hidden from his father in a cave on the island of Crete and was fed on honey and goats. When he cried, a band of men called Curetes clashed their spears and shields together so he would not be heard by Cronus. When Zeus grew up, his mother gave him a magic potion that he put in Cronus' drink to make him sick. Cronus first coughed up the stone wrapped in baby clothes and then all of Zeus' brothers and sisters who were still alive. They all joined in battle against Cronus and overthrew him with the help of the Cyclopes and the hundred-handed giants. In this way, the Titans were defeated and their battle leader, Atlas, was given the punishment of holding the sky on his shoulders for eternity.